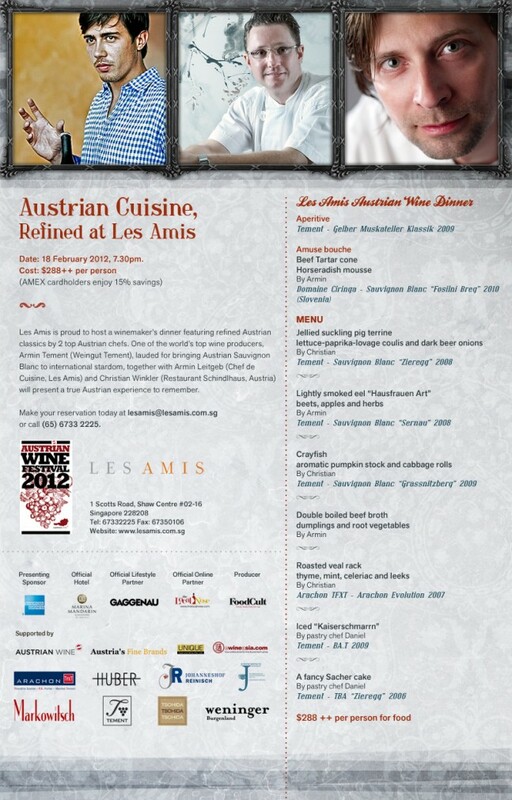 The dynamic and inexhaustible Austrian wine marketer, Michael Thurner, of Austria Fine Brands, is on the campaign trail in Singapore again and back by popular demand, the Austrian Wine Festival 2012. This will be a unique experience and not to be missed, as focused largely in sauvignon blanc; yes sauvignon blanc can have pedigree, or for that matter, display distinctive qualities of terroir, the coveted association between a distinguished vineyard site permeating through the wine. Located in Styria, on the border of Slovenia, Tement is the quintessential example of sauvignon blanc pedigree moreover, the most conclusive proof of the variety displaying terroir, defining several single vineyard plots within their property and vinifying individual wines that distinctly express the temperatures of different vineyard aspects and complexity of the limestone and schist soils on sloped terraces that were once a coral reef formed over 20 million years ago. Below are full details of the wines and menu – all reservations through Les Amis.